My 8-year-old son sat on the floor and just stared at the box of Legos. He’d been that way for the past ten minutes. “I really want to build something but I don’t know what to build”, he replied. When I was a kid, I would often get overwhelmed by all the stuff I could build. 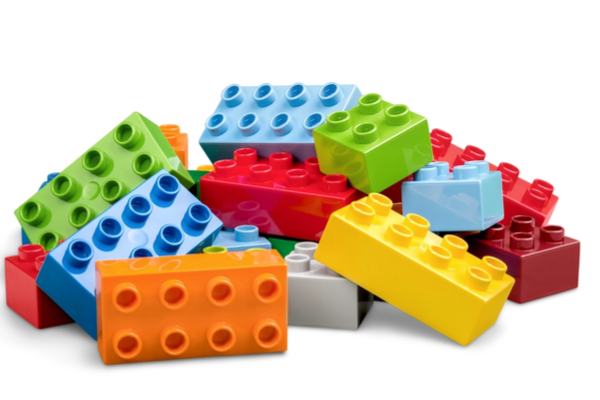 With all those bricks, you can build anything! The possibilities are endless! But sometimes what you really need is some direction. A picture, a plan, a push in the right direction. I hear something similar from people interested in learning Dynamo. They want to learn but they’re not sure what to do or where to start. There are SO many things you can do with Dynamo that sometimes it’s hard to get started. 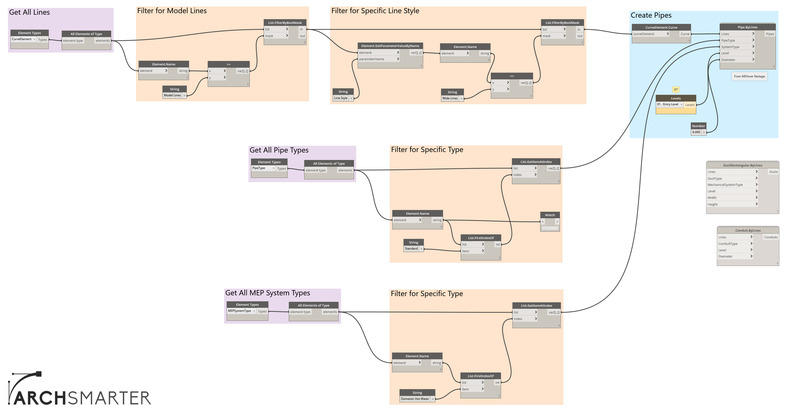 Dynamo is a great way to automate tedious tasks (among other things) in Revit. It’s an LOA 300 tool that can make you a lot more productive. While I’m sure you could fill a couple of sheets of paper listing what you don’t like to do in Revit, knowing what can and can’t be easily automated is more difficult. With that in mind, I combed through my script library and pulled out 15 good examples of tasks you can easily automate with Dynamo. Want to learn Dynamo the easy way? If so, sign up for my free course, Dynamo for Busy People. I’ll email you a new Dynamo script every day for five days. I’ll also include an annotated screenshot explaining how the script works. At the end of five days, you’ll have five time-saving tools plus the knowledge of how they were created. Click here to enroll in the free course. This script reads level names and elevations from an Excel spreadsheet and uses this information to create floor levels. This is a good script when you’re starting a new project and need to do some setup before you begin modeling. This script collects all the area elements and filters for “Gross Building” area. It then sums up the areas first by level then total to calculate the GFA (gross floor area). Next, it reads the property lines and extracts its area. Dividing the GSF by the site area yields the FAR (floor area ration). The script outputs the results to a Watch window but it could be modified to output to Excel or to text notes in a drafting view. This script exports to Excel all the instance and type parameter values for each instance of the selected family. This is a good script to use when you need to generate FFE (furniture, fixtures, and equipment) spreadsheets to share with the owner or other consultants. This script automatically dimensions vertical and horizontal grid lines in a view. No need to click every grid line manually. This script does it all in a few seconds. Need to place a legend on a bunch of sheets but don’t want to do it manually? No a problem using this script. Simply select the range of sheet, the legend to add, and its insertion point then let Dynamo do the rest! Need to know how many walls of each wall type are in your model? How about the total length for each wall type? Use this simple but useful script. It gets all the wall types in use in the current model then outputs the count and total length for each type. Has this ever happened to you? You just finished numbering all the parking spaces in your model when you realize you skipped a couple. Ugh. . . Renumbering things in Revit is a real pain. Fortunately, this script makes it a LOT easier. Draw a line of spline through the parking spaces you want to renumber then specify the starting number. Dynamo put the parking spaces in the right order then renumbers them. What a time saver! This script creates sheets from a list of views then puts those views on the new sheets. It’s useful for when you need to quickly review a set of views or when you’re cartooning your drawing set. It’s that time of the year again – Revit upgrade season While it’s great to see what new features are available in the latest release, it also means you need to upgrade your project and family files. This script makes upgrading your families a breeze. First, make a copy of your family library. Next, select the folder to upgrade in Dynamo. Click run then sit back and relax. Dynamo will open each family file, upgrade it to the version of Revit you’re running, then save the file. Want to quickly add some pipes to your model but all you have is an AutoCAD drawing? This script makes that process really easy. Import the DWG file into your model then run the script. It will generate the pipes from the specified line type. You can easily modify this script to generate ducts as well. It seems like every project has that person. You know, the cowboy or cowgirl who knows the office standard but ignores it anyway.The type of person who says “Sure, all text is SUPPOSED to upper case, but I just don’t feel like it today”. Rather than pull your hair out in frustration, run this script instead. It will change all text notes in the model to either upper case or lower case. Suppose you need to change the family type of a bunch of different family instances in your model. Sure, you can do this manually but you might miss a few or select the wrong family type. Better to let Dynamo do that for you. In this example, I change all the doors that are 2134mm high to 2032mm high. Note that this script works across door families. 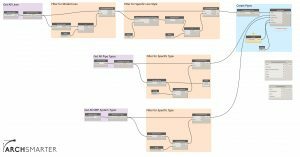 Ready to Save Time With Dynamo? Ready to start saving some serious time with Dynamo? Sign up for my free course, Dynamo for Busy People. I’ll email you a new Dynamo script each day for five days. I’ll also include an annotated screenshot explaining how the script works. At the end of five days you’ll have five time-saving tools plus the knowledge of how they were created. Sound good? Click here to sign up for the free course. What Else Do You Want to Automate? What other tasks do you want to automate in Revit? What Dynamo script would save you a lot of time? Leave a comment below! Are you looking to automate the creation of a drawing list? Do you have several drawing lists? If so, how do you sort and order them? 2. tel Dynamo to read the “name of the Revit views/sheets” and then rewrite them in the chart. 3. or is there another way to do this? Could you give me a little more information? Are you trying to create a drawing list and Revit’s drawing list isn’t sufficient? Do you need to create placeholder sheets for some of the sheets? Is there a way to create an automated drawing schedule/matrix where we have drawing sheets in the X coordinate, all revision types in the Y coordinate, and the value being the date of revision on only the specific sheet. All the information is there in Revit to do it, they just don’t talk to each other. Can dynamo be used to purge items? For instance, I’d love to have a script that can purge out unused line styles, hatch patterns, and view filters. It seems every time we are halfway through a project the model is full of these. You can’t purge like you can using the Revit purge unused command, unfortunately. You can delete elements pretty easily using Dynamo. The trick is to determine which elements you want to delete. Also, can dynamo be used to create work sets and modify view templates? I like to use worksets in a number of view templates however Revit doesn’t allow them to be in a Template/Un-centralized model. Yes, you can use Dynamo to create worksets. I like to list my worksets in Excel then use Dynamo to create them in my model files. Sorry about that. I fixed the image so you can now see the enlarged version. Can Dynamo be used to “save as” or create a new file when setting up a project? I have a script that will fill in the title block and I am trying to eliminate the step of having to do a “save as” either before or after running dynamo. I would be interested in a solution to this as well! We are trying the same thing in the office. Why is this not easily found??? Please help!! The Clockwork package contains a node called Document.SaveAs. It’s found in Clockwork > Revit > Document. You can use this node to save the current Revit model to a new file. I have been trying to get my shared parameters to come in with our company boarders in Dynamo. I have the boarders and project info sheet loading fine but the parameters don’t seem to come in. Any ideas on that? Are the shared parameters not loading when you load the boarder family into your project file? Does the project file have the same shared parameters defined? michael kilkelly, thank you ever so for you post.Much thanks again. michael kilkelly, thank you for your blog post.Really thank you! Awesome. Yes, this is definitely possible. I cover a similar example in my Dynamo for Busy People course. Auto dimensioning of pipes and ducts from reference line. Please see another use post below. Hey great tips about Dynamo..i’m pretty new to it..gonna try out the place legend on multiple sheets one. Do you know how I could Batch print sheets in multiple revit projects all at the same time. Eg. I have a school with multiple buildings and each building is in a different file so everytime I need to print a whole set i have to go into each file and print the sheets and then merge the sheets after. How could I set up a script that allows you to print the sheets in each and merge them automatically? batch render views either one after another or all at the same time whichever is easier. Ideally set up views and then select to leave running overnight. Have one for you, How about getting square footage of each floor type used in the model? This will also help with wall tiles, wall covering and so on. I would think that the schedules would do it. But it never gives a total. Are you looking to get the total square footage of each floor type? I have downloaded all the recommended Dynamos packages but can not find it anywhere. I am new with Dynamo and I will appreciate any help. Those nodes are actually String nodes (Core > Input) that have been renamed. Sorry for the confusion. how would you go about creating placeholder sheets using shared parameters? How could you use Dynamo to set up multiple room elevations on a sheet? Do you want to generate the room elevations then add them to a sheet? Or do the room elevations already exist? can i create alot of column by alot of rectangular by dynamo? Are the rectangles drawn as model lines? If so, you can get the center point from the geometry and use this as the insertion point for the column. Can we purge overlapping elements (pipe, equipment ,tag or anything)in a project using dynamo? It’s possible but a little tricky. You would need to specify exactly what you want to check, get its geometry, then see if that geometry intersects other selected elements’ geometry. Is there any way to measure the distance or dimensions between multiple revit families? Unfortunately, Revit doesn’t have a way to hide one text note style and not others. There may be a way to do this using worksets, phasing, or changing the text note style color to white. But it would be a bit of a hack. I guess, You can achieve the requirement by proper using of Revit revision option with tag , you can add your required revision note say for Rev-A and you can hide them by setting Rev-A as non in tag and cloud setting in view option. This should serve the purpose. What criteria do you want to use for the color-coding? Height above the floor? Wall type? Can dynamo generate an entire site of a particular city ? Like grasshopper does . I’m a student and need to generate buildings around my site which is located in north Hollywood . Thank you so much for this site! it is SO unbelievably helpful! I’m very new to Dynamo and am having trouble finding the ‘Sheet Prefix (String)’ node which you use in the ‘ArchSmarterDynamoAddLegendtoSheets’ script. Is this a custom node or is it from a package you created or installed? James, you’re right. I simply renamed the node. Sorry for the confusion. No need to apologize Michael, thank you very much for replying. We are using Real time Rendering Plugin for Revit ( https://enscape3d.com ). We wanted to automate some tasks in Revit. The 3D scene of Interior Scene will be created by our designers in Revit (Eg : Living Room). Now this scene will be rendered using enscape3d Plugin. 2. The script should auto export Screen shot which the plugin will deliver after change of object in the scene. How would you automate exporting multiple 3d views from revit to Navisworks using dynamo? This has to be done everyday at a specific time. You can specify a keyword to filter the 3D views. What about creating multiple views for different disciplines? And then also creating sheets to go along with it. It’s something we do almost daily company wide and it would save us so much time to just run a script instead even if we have extra views and sheets. Hi, I’m pretty green to Dynamo, so please make it an easy answer ha ha. Is there a way to get Dynamo to populate/create the Pipe Segments & Sizes under Pipe settings in the Mechanical Settings from an Excel sheet, or even export the current sizes to an Excel sheet. I’m going to try to keep this short. What I’m trying to achieve using Dynamo is to automate the builders work modeling. Thus far I’m able to place a generic model void family at the intersections of services with walls and floors but is stuck at taking this to the next level. I would like Dynamo to pick up the service size and adjust the void family accordingly (with an added tolerance). After this, I would like Dynamo to cut these voids from their hosts. If you can assist me with parts of scripts which I might combine to do all this. Is it possible to draw the thickness of each wall material and insert it into the statement. I have Revita 2014. If such a script exists then I will be grateful for the link. Or can you create a label that will download individual wall materials and its thickness in the order as they are in the wall? Is it possible to make 3D model from a PCF (Piping Component File) using Dynamo? If it’s possible, is there a solution to make all welds visible on the model? Marko, are the PCF files generated from Plant3D? Identify every wall instance acting as room bounding for every room and extracting some of their parameter. Then bringing this information (i.e. comment, type comment,…) to a new shared parameter in every Room. Are you trying to identify which walls belong to what rooms? My problem: Structural information doesn’t get modelled, as an example. The Footing schedule was manually typed out and and the footings are all 2D linework in the plan views. In my mind I imagine I could type out all the data really quickly into excel, information such as, (length, width and depth), 2400x1200x600. I would also perhaps like Dynamo to automatically re-name each family based on that information (ex. F01-2400x122x600, being the family name based upon the data of the geometry). Do you have a workflow utilizing Dynamo to help me with this? I’ve not tried out Dynamo so far, but am very curious as to its capabilities so I’ve been reading a fair amount of what people are using it for. Is there any way to use Dynamo to actually “lock” a workset in a Revit model? (similar to the way the old Autocad locking of a layer would work). I need to be able to still see the contents of this other workset, but not select it or move it by accident. It’s not possible to lock a workset but you could pin all of the elements on a particular workset. Not as convenient as locking a layer in AutoCAD, but the same effect (somewhat). The Element.SetPinnedStatus node from the Rhythm package should do the trick. Is it possible to import an Excel phase list into revit? Do you want to create phases in Revit based on data in an Excel file? Am I understanding correctly? I would like to link a Revit model into Civil 3D file but keep the link dynamic. This means any changes made to the Revit model must reflect in the Civil 3D file, perhaps dynamo be able to do this? This article is amazing and makes me want to go learn how to work with Dynamo. I can see it looks a lot like Grasshopper (Rhino Plug-in) which I used to works with. I was looking for a script or a smart family that can assign a Detail Number to a view based on the location of the view on the sheet. For example, if I place 5 views on a sheet, Revit, by default, names them 1,2,3,4,5. Then I have to manually change their detail number to A5,A7,B2… Based on their row and column location. Is that something Dynamo can do or you think it’s better to make a smart family. I think I still don’t know the relationship between Revit and Dynamo quit right. Great article, you seem very knowledgeable with Dynamo. I was curious if Dynamo can be used to automate the placing of family instances in a drawing? I haven’t been very successful in finding info on the web. Any insight / pointers in the right direction would be much appreciated. Thanks for any help! I am trying til make your script number 10 “Create pipes from lines”. I want to use it to convert detail lines to pipes, but i can’t get it to work. It seems like it is going wrong in the group “Filter for Specific Line Style” because the note “Element.GetParameterValueByName” shows a empty list. But in the group “Filter for Model Lines” I can see the lines drawn in the project. Do you have any idea what could be wrong? I use Revit 2019. Is it possible to do these steps in dynamo ? *Shop drawing view and drawing sheet etc. If yes it would really help my job spending hours making this manually in revit. Can you help me making scripts for this? Thank you in advanced. Hello. Thanks for this article!! i am trying to do the auto dimension for the grid lines and I was wondering what the lunchbox is.. It says its where the curves.dvidecurve node is found. Hello ! thanks for your helpfull ! Of course detail element must be inserted as much as system there is !